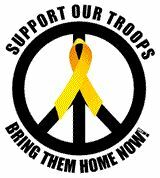 We came from all across America, young, old, military veterans and active duty military, those who have been injured or maimed in war, family of those who have been or are currently active duty military, and family of those killed in war. 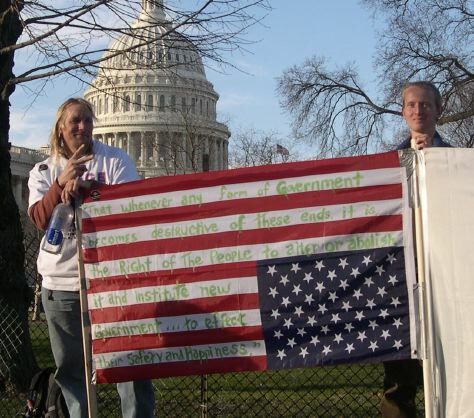 There were busloads of high school and college students, busloads of labor and union representatives, and most of us were just plain concerned citizens, all of who came from across the nation to represent the moral peaceful majority. We were nearly 500,000 strong, and at one point had completely surrounded the people's house, our nation's capitol building. One half a million of us gathered in January, and while we would have marched in frigid and or wet conditions, Mother Earth certainly approved of our action, as she threw abundant sun and tee shirt weather down onto us. We were all there for the same reason. 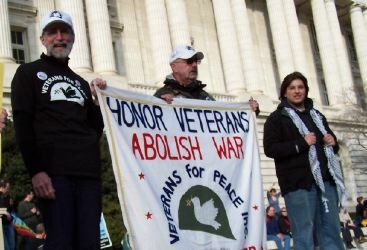 To make sure that the congress we had just voted in had heard loud and clear the main reason we elected them: To end the illegal war that was based on lies, which continues in the immoral American occupation of Iraq, and to demonstrate that we mean business- Bring Our Troops Home NOW. The end of the march did not bring an end to our work however. One thousand of us stayed in D.C. for Lobby Day. A chance for the average Joe to talk to their elected officials. Imagine, we the ordinary citizen, were walking the halls of congress to discuss our concerns with OUR elected representatives, even though we don't have the billions of dollars to contribute to their re-election campaigns that Big Business has. This shouldn't be so difficult, after all this is not Halliburton's congress, not General Electric's congress, not Big Pharmacy's elected officials, not Big Oil, not Boeing's, not Lockhead Martin's, not any of the War Profiteer's congress, but ours... the people's congress. But apparently this type of interaction between Joe Q. Public and those we pay to represent us only occurs when specially arranged. On Monday we spoke to Congressman Delahunt's aides in Washington, while others from his district held similar meetings with his aides in Hyannis and Quincy. 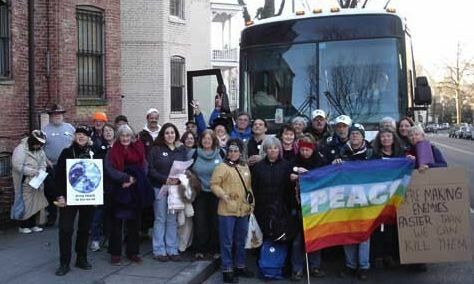 And thanks to the folks from United for Peace, these meetings took place between each congressman and senator and the moral peaceful majority from nearly all 50 states. I came from that meeting somewhat hopeful, believing that our sense of urgency was well noted. The people are now on to the fact that most republicans only do what is best for big business- and yes, President Bush and Vice President Cheney may have frightened the bageezus out of us with their impending smoking gun in the form of an imminent mushroom cloud, but you can only cry wolf for so long. 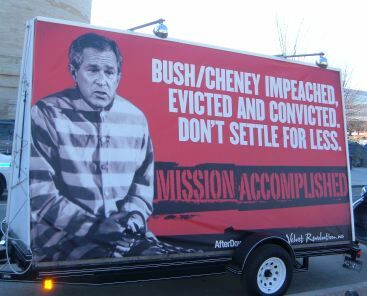 The people have decided we shall not let the gloom and doom of Mr. Bush's "War on Terror" - be afraid, be very afraid - scare us into giving away our freedoms. The greedy pigs at the trough have been exposed, and the people have said enough. Simply, the people don't like being played for fools, and we are pushing back hard. Furthermore we will not stop. If this past weekend was any indication, the peace movement is in it infancy and growing like it's on hormones. Thanks to the dedicated folks of United for Peace and Justice these meetings were arranged and took place between our congresspeoples and the moral peaceful majority from nearly all 50 states. I, a registered nurse with a group of 5 others from the 10th district including a veteran of vietnam, and an SEIU labor representative spoke face to face with Congressman Delahunt's aides in Washington DC. We came away from that meeting hopeful believing that our sense of urgency regarding the need to end the death and destruction to our troops and the Iraqi people, as well as taking care of our veterans when they come home was well understood. It is true, the people in numbers can effect change. But we cannot, and must not, rest. Not now, not ever. Just look at where 5 years of taking our eye off the ball has gotten us. 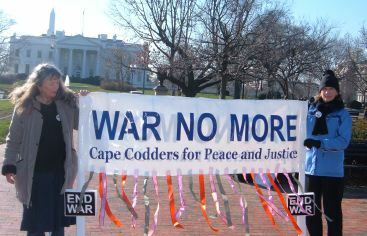 Please continue to do what you can to move the peace movement forward. Attend a local vigil, and call your congressional representatives often!